Referring to Luke 17:33, 'Whosoever will save his life shall lose it, and whosoever will lose his life shall find it' (the wording used by Housman). Nod with your hand to signify as much. Alcmaeon: I journeyed hither a Boeotian road. Chorus: Sailing on horseback or with feet for oars? Alcmaeon: Plying by turns my partnership of legs. Alcmaeon: Not all that men desire do they attain. "Fragment of a Greek Tragedy". This parody was first written in 1883, but quoted here from a revised version of 1927. "Introductory Lecture" delivered on October 3, 1892 at University College, London. The average man, if he meddles with criticism at all, is a conservative critic. His opinions are determined not by his reason -- 'the bulk of mankind' says Swift 'is as well qualified for flying as for thinking' -- but by his passions; and the faintest of all human passions is the love of truth. He believes that the text of ancient authors is generally sound, not because he has acquainted himself with the elements of the problem, but because he would feel uncomfortable if he did not believe it; just as he believes, on the same cogent evidence, that he is a fine fellow, and that he will rise again from the dead. Introduction to Astronomicon of Manilius, Lib I. (Cambridge University Press,  1937) p. xliii. Saturae of Juvenal (Cambridge University Press,  1931) p. xi. I rather doubt if man really has much to gain by substituting peace for strife, as you and Jesus Christ recommend. Sic notus Ulixes? do you think you can outwit the resourceful malevolence of Nature? God is not mocked, as St. Paul long ago warned the Galatians. When man gets rid of a great trouble he is easier for a while, but not for long: Nature instantly sets to work to weaken his power of sustaining trouble, and very soon seven pounds is as heavy as fourteen pounds used to be. Last Easter Monday a young woman threw herself in the Lea because her dress looked so shabby amongst the holiday crowd: in other times and countries women have been ravished by half-a-dozen dragoons and taken it less to heart. It looks to me as if the state of mankind always had been and always would be a state of just tolerable discomfort. "Letter to Gilbert Murray" (April 23, 1900). "Letter to Neilson Abeel" (October 4, 1935). Additional Poems, No. 18, st. 1 (1937). From a list of insults drafted by A E Housman, and posthumously published in Laurence Housman's A. E. H. (1937) pp. 89-90. The name was left blank in the original, but was intended to be filled in and used when a suitable subject should turn up. A man who possesses common sense and the use of reason must not expect to learn from treatises or lectures on textual criticism anything that he could not, with leisure and industry, find out for himself. What the lectures and treatises can do for him is to save him time and trouble by presenting to him immediately considerations which would in any case occur to him sooner or later. The difference between an icicle and a red-hot poker is really much slighter than the difference between truth and falsehood or sense and nonsense; yet it is much more immediately noticeable and much more universally noticed, because the body is more sensitive than the mind. It is supposed that there has been progress in the science of textual criticism, and the most frivolous pretender has learned to talk superciliously about "the old unscientific days". The old unscientific days are everlasting; they are here and now; they are renewed perennially by the ear which takes formulas in, and the tongue which gives them out again, and the mind which meanwhile is empty of reflexion and stuffed with self-complacency. And, what is worse, the reader often shares the writer's prejudices, and is far too well pleased with his conclusions to examine either his premises or his reasoning. Stand on a barrel in the streets of Bagdad, and say in a loud voice, 'Twice two is four, and ginger is hot in the mouth, therefore Mohammed is the prophet of God', and your logic will probably escape criticism; or, if anyone should by chance criticise it, you could easily silence him by calling him a Christian dog. To be a textual critic requires aptitude for thinking and willingness to think; and though it also requires other things, those things are supplements and cannot be substitutes. Knowledge is good, method is good, but one thing beyond all others is necessary; and that is to have a head, not a pumpkin, on your shoulders and brains, not pudding, in your head. A Shropshire Lad (1896) on Wikisource. No. 4 ("Reveille"), st. 6. No. 19 ("To an Athlete Dying Young"), st. 2. No. 19 ("To an Athlete Dying Young"), st. 4. Blew hither; here am I. No. 24 ("Epithalamium"), st. 3. No. 37 ("Epitaph on an Army of Mercenaries"). Experience has taught me, when I am shaving of a morning, to keep watch over my thoughts, because, if a line of poetry strays into my memory, my skin bristles so that the razor ceases to act...The seat of this sensation is the pit of the stomach. Houseman's test for great poetry. They say my verse is sad: no wonder. No. 47 ("For My Funeral"), st. 3. No. 48 ("Parta Quies"), st. 1. A remark made in conversation, according to Grant Richards Housman 1897-1936 (1942) p. 100. According to Frederic Prokosch, in his Voices: A Memoir (1983), this was once said to him by Housman. 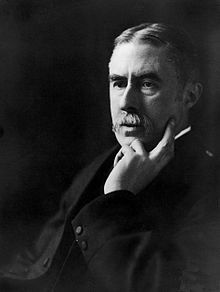 Housman is one of my heroes and always has been. He was a detestable and miserable man. Arrogant, unspeakably lonely, cruel, and so on, but an absolutely marvellous minor poet, I think, and a great scholar. John Berryman, The Paris Review, Winter 1972.